It was a willlddd roller coaster watching ‘My Secret Hotel’ episodes 7 to 10. A very very wild one. There were many ups and downs and turns along the way, but thankfully ‘My Secret Hotel’ is still holding its ground. In episodes 7 & 8, we witnessed Soo Ah drop out on Hae Young at the very last minute on their wedding and run away with her driver Ki Ho leaving behind a lonely Hae Young. He then grasps the opportunity to restart his relationship with Sang Hyo by asking her to marry him so for his own personal reason and for the sake of the hotel, they get married a second time (although not quite as lovey-dovey and sincere as the first). They go on their honeymoon, but of course external factors come into play and have to ruin what could have been something very good for us Hae Young and Sang Hyo supporters. The drama also brought some attention on the murder mystery with another death in the hotel, this time the death of Heo Young Mi. Despite many people being accused, it seems like we aren’t getting very far with our investigation. Can the killer just reveal yourself already?! Lol. Unlike episode seven that I was satisfied with and enjoyed watching, episode eight left a bad taste in my mouth. A very sour and bad taste in my mouth. I absolutely hated the ending to episode eight that just left me in anger and confusion. If I’m going to be honest here, It felt like I was watching some makjang drama for some reason and like it was a totally different drama from what we saw in ‘My Secret Hotel’ earlier on in the beginning. It makes me sad to say this but I can actually feel the difference in the drama with the change in writers since writer Kim Ye-ri passed away (she was only able to write the screenplay for ‘My Secret Hotel’ up to episode 4). At first, the transition was unnoticeable but as each episode progressed, the difference started to get more and more obvious and I really didn’t want to believe it because I sincerely loved ‘My Secret Hotel’ so much that I was forcing myself to think that it was still consistent but the ending of episode 8 just got me turning my head and frowning on it all. I also feel like with the way that it progressed, the drama is a more mellow and serious version of ‘Marriage Not Dating’ where Sang-hyo is in a false marriage with Hae Young but is in love with Sung-gyum. I was just truly so disappointed by the end of episode 8 because I felt like the drama changed and maybe this is because of Hae Young and Sang Hyo’s marriage but I don’t know. There’s just something about episodes 1-4 of ‘My Secret Hotel’ that was so refreshing and beautiful and sentimental. I felt like these last few episodes have started to run away from that and it makes me absolutely sad. I would have never imagined that Sang Hyo be the type to physically punch someone in the face, especially Hae Young. I mean, yes, the comments made about her were very cruel and harsh, but the drama never made Sang Hyo out to be that type of person so the moment she punched Hae Young in the face, I was so shocked and confused. Then to make things worse, the beginning of episode 9 was making me cringe so hard. It was bad. Super bad. I was just like, “Really?! REALLY NOW?! You’re going to make things so dramatic? Lord, please.” Thankfully the episode got better and easier to watch as the minutes passed by. We returned to seeing the flashbacks (YAY! I MISSED THE FLASHBACKS SO SO MUCH!) of Sang Hyo and Hae Young seven years ago when they were still living together in Las Vegas. Complications arise again over their work and jobs where the both of them remain stubborn about it. We also find out more about the reasons as to why their marriage failed and one of them was because of Hae Young’s sudden disappearance on Sang Hyo that left her heart-broken and conflicted. His job remained a more powerful motive for him to leave and so because of this, Sang Hyo came into despising Hae Young and holding a grudge on him, even seven years later. Hae Young needed to leave for New York for his job and wanted Sang Hyo to go with him, but she refused to because she wanted to stay in Las Vegas to achieve her dreams of working in a hotel. The thing that strongly (STRONGLY) pisses me off about this is how Sang Hyo handled all of this. If she’s able to stay in Las Vegas to pursue her dreams, then Hae Young should be able to leave for his work as well. Sang Hyo was hurt by the fact that Hae Young left her, but it wasn’t his fault and she should have known as well. He had already told her that he needed to move to New York for his job, but she remained stubborn and didn’t want to leave. So then when he did leave, she got hurt. She also said that she never forced him to stay with her so when he did leave, she was heart-broken and angry at Hae Young. It’s not Hae Young’s fault he left the way he did and technically, he didn’t leave without saying a word because he did relay to her many times that he needed to go to New York for work purposes but she just chose to refuse to listen to him. Was she really expecting him to continue to stay with her just for her? Did she really expect Hae Young to stay behind with her and risk his job for her? He had a job as well and had other things to take care of. I wouldn’t blame Hae Young for the way that things turned out; I think it’s a combination of both Hae Young and Sang Hyo’s faults that contributed to their downfall. It makes me mad that Sang Hyo feels this way towards Hae Young, because if you think about it, it wasn’t even that Hae Young didn’t love her anymore that he left – it was because he was in the risk of losing all that he worked for on his job that he had to leave. There was something important that came up that he left the way he did. He didn’t leave because he didn’t love Sang Hyo anymore; He even encouraged her to move with him to New York so that they can start anew and even bought a ticket for her. He invited her to move with him, but she chose not to and she’s going to blame him? She can put her job first, but he can’t? And the sad part is Hae Young is beating himself up over it because he still loves Sang Hyo so much that he’s willing to take the blame for it, but it’s not only his fault. What Sang Hyo should do is recognize her fault as well in all of this and not be so stubborn. “It was my mistake that I was being stubborn and selfish only thinking of me. Maybe we should have tried to find a solution to the problems that arose back then.” (And at the very end, she ended up working in a hotel in Korea. LOL. So much for wanting to stay in Las Vegas because they had the best hotels). Also when Sung-gyum was mad at Sang Hyo for suddenly getting married to Hae Young, I was so mad because he kept asking her if she was even thinking about him and everything and I’m like, one, you weren’t even there to understand the situation she was in, and two, she unfortunately has other things she set as her priority other than you. Sung-gyum was being so selfish during this scene; It’s as if he thinks Sang Hyo doesn’t have anything to do or worry about other than him. I’m sorry to break your fragile heart Sung-gyum, but you are probably the last person Sang Hyo thinks about when she’s in such a situation. I mean, she was in danger of ruining the hotel’s reputation and image. It’s not like she was going to stop herself, the wedding, and everything else and be like, “Oh wait! There’s still Sung-gyum! I shouldn’t get married because I know he wouldn’t like it. Even if the hotel plunges and dies, it’s okay because I’m doing all of this for Sung-gyum.” No, Sang Hyo would not react and think like this Sung-gyum so stop holding such expectations for Sang Hyo like you are all that she thinks about. I don’t care for Sung-gyum as a character because there’s not much to him that intrigues and interests me, but he was sort of being selfish asking Sang Hyo those awful questions. Thankfully, episode nine got better by the time it ended, but episode 10 felt like such a filler episode. Not much happened so there was not a lot of progress. Hae Young spent most of his time alone in Sang Hyo’s apartment while she went on with her daily routine of attending work and interacting with her co-workers and whatnot. -sigh- I take this drama waaayyyyyy too seriously because almost everyone in this drama is making me mad and frustrated. If you’re a Sung-gyum and Sang Hyo shipper, the last few episodes would have been an amazing treat for you. However, if you’re a Hae Young and Sang Hyo shipper like me, then the last few episodes were really dreadful, disappointing, and devastating. Hae Young’s endless efforts to impress and capture Hae Young’s attention like maybe performing JYP’s ‘Honey’ in front of everyone at the company dinner was to no use for she was still more impressed with Sung-gyum’s singing performance. I might be in the small minority here but I can’t stand Sang Hyo. If she doesn’t want to be with Hae Young, she should stop avoiding or ignoring him and instead talk to him face to face about their past. I don’t like how she’s not even giving Hae Young a chance to explain himself or to even hear him out. She’s just going to do whatever she wants which is being with Sung-gyum which I would not have a problem with if she wasn’t so stubborn. I can’t believe that I’m feeling this way about ‘My Secret Hotel’ because I absolutely loved it when it first started out. It was so sentimental, emotional, and poignant. Now it’s just a huge mess where it’s deciding to focus more on the irritating and frustrating love triangle than our murder mystery. I wish there was a balance between both, but our love triangle is getting way more screen time and the thing is we’re making absolutely no progress. Hae Young is still pursuing Sang Hyo who only has eyes for Sung-gyum. We’re not getting anywhere and this is frustrating. We’re more than halfway into the drama and it doesn’t seem like any time soon that Sang Hyo is going to look at Hae Young. If Hae Young and Sang Hyo is our end couple, I do not want the very last episode to be of them making up and finally waking up to realizing their faults with the next five episodes shedding light on the love triangle. No. I do not want any of that crappy ending nor do I want anymore BS along the way. Sang Hyo, it’s either you tell Hae Young straight up and confront him on why you don’t want to be with him anymore and why you prefer to be with Sung-gyum or you confront your true and honest feelings and stop denying them. Please, can you make it a little easier for me to watch ‘My Secret Hotel’?! Lol. ‘My Secret Hotel’ still has those little funny moments in between in every episode that makes me giggle and laugh in happiness. Like in this episode, I was just so entertained and amused by Jin Yi Han when he was performing to JYP’s ‘Honey.’ I had no clue he could dance and perform like that, but man, is he a star when he’s on stage. 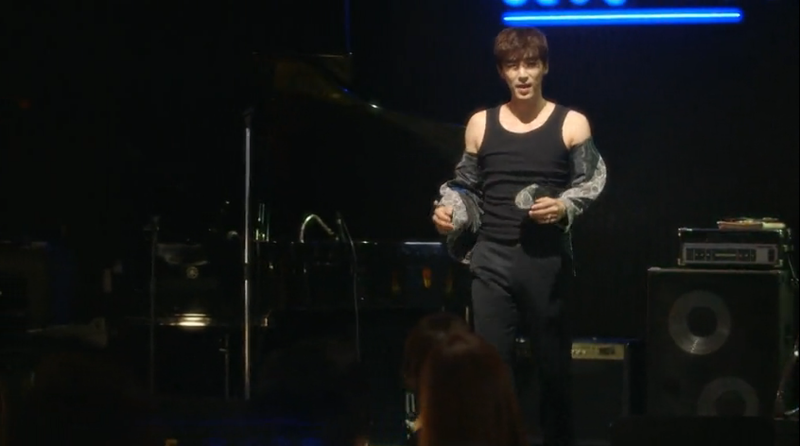 My favorite part as you can see with the screen shot above is when he took off his sweater. The whole time the only thing I could think of is, “OPPAR IS SO COOL” while fanning myself to keep my face from turning any redder. Other hi-lights included the fight between Soo Ah and stalker Jung-eun. I love how Soo Ah is sticking up for Hae Young and supporting him by telling Jung-eun that Hae Young and Sang Hyo are still in love with each other. That’s really sweet of her because she could have said something else, but instead chose to stick with that statement. Soo Ah’s definitely changed into a likable character in this drama and I’m really glad that the drama has done that. Eun-joo’s reaction to finding out about Sung-gyum and Sang Hyo was also very funny and cute. She’s so jealous of Sang Hyo, but she can’t do anything about it. Haha. 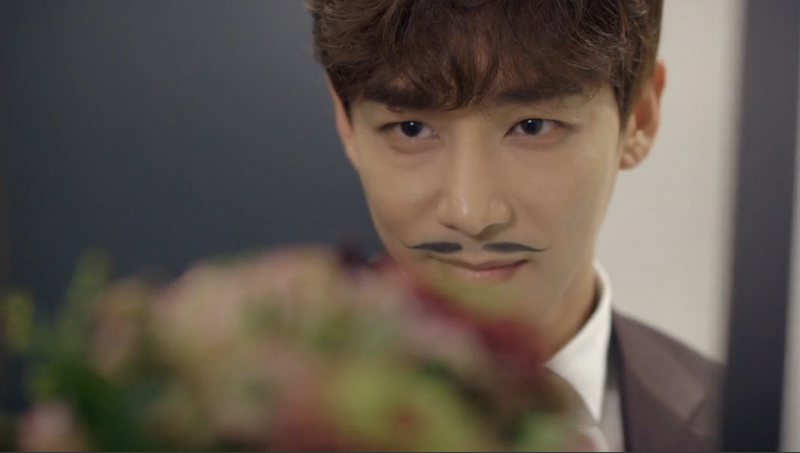 Hae Young and his drawn mustache was seriously way too adorable for words! Since Sang Hyo drew it on his face, he didn’t want to wash it off and continued to wear it the whole day. Now THAT is adorable! And you know, Hae Young looked great with it too I’m not going to lie! Overall, if there’s anything I’d want from ‘My Secret Hotel’, I really can’t wait for the day that Sang Hyo wakes up and realizes that she also did wrong and makes up with Hae Young. The drama is so far making Sung-gyum and Sang Hyo out to be our end couple and I would hate to see that happen. I really will not tolerate any of that, but we’re already ten episodes in and we’ve only seen Sang Hyo shut Hae Young down every time they talk without even giving him a chance to explain himself. Here’s to hoping she opens up and matures. At least that way, even if she doesn’t want to be with Hae Young, she can let go of whatever resentment she has towards him and move on with her life. Thank you for posting your thoughts on this drama and I enjoy reading it. To me, after the the writer changed, the drama seem to loose the focus and the love plotline is all over the place. I feel dizzy to follow Sang Hyo on her love life because she keeps making bad decision all the time. She’s lucky that she has two hot men falling for her hard and to me, the story makes it look like she wants both of them. The reason she was mad at Hae Young 7 yrs ago is so weak, and it was mstly her fault for putting her job first. Now, history repeats with Sung Gyum – She accepts his love but agrees to the fake marriage with the man she clearly still has the feeling for just because her job again. Now, she expects Sung Gyum to u derstand her just like 7 yrs ago, she expected Hae Young to hornor her desire to success in her job. I just roll my eyes a lot after episode 4, maybe because the first 4 episodes set a strong expectation but the later episodes can’t deliver it.